I’ve talked about it before in More on technology compatibility kits in app development. 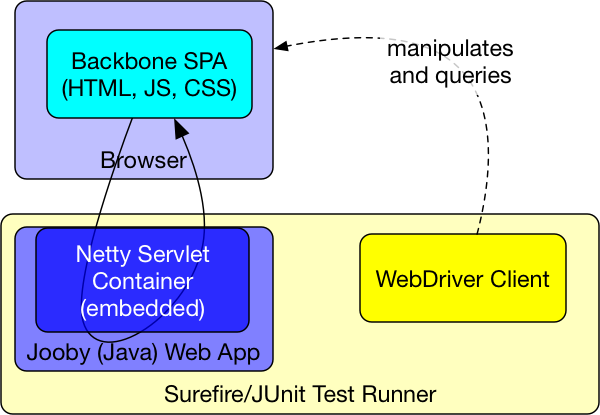 So one of those implementations, for a technology I’d never heard of before - Jooby - has a maven build, and some integration tests of its own (over and above Pete’s test harness). Maven gets a bad rap, and WebDriver suites people think should be slow, so I thought I’d take the solution and attempt to put quick WebDriver tests on top of it. 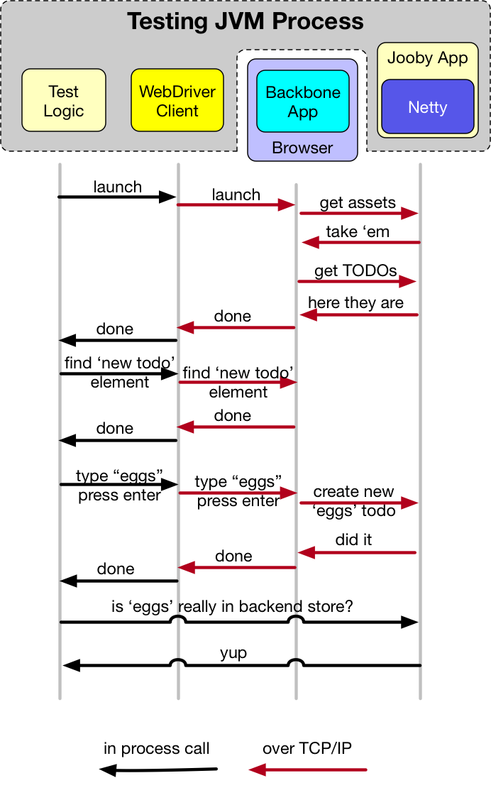 My fork of that ‘todobackend’ implementation - github.com/paul-hammant/todobackend-jooby - is the result. Watch the build here, it is 20 seconds in this take, but it averages at 16 seconds. It is a shame YouTube does not have a slow motion for the WebDriver phase. Have a phase that mocks out (virtualizes the services of) the Java Server, and just tests the TodoMVC Js/HTML app on its own in the browser using WebDriver. New era for Java Web applications. With SparkJava, SpringBoot, Vert.x, Jooby and many others we are seeing the end of WAR file deployments to standalone Servlet containers (or larger still J2EE servers). Of course the Java community didn’t invent the style, they just took note of the advances in Ruby’s Sinatra framework and others. It turns out that treating the web-enabling technology as a library and promoting terser scripting of them that are also XML free, appeals to developers. Looking back to servlets, JSP, and WAR file specs from 1996/7, we could say they were a disaster. These new technologies all use the main() method. They therefore have a primordial entry point for setup, and the back-flips we used to have to do between ‘listeners’, ‘servlets’ and ‘filters’ because we did not have one are now a thing of the past.